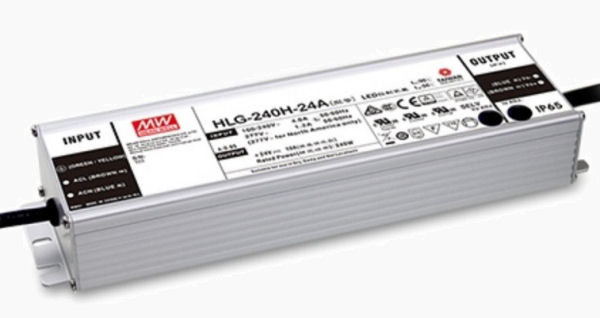 The LED-HLG family are highly efficient, waterproof, LED power supplies, primarily for lighting applications. With a 90~305VAC wide AC input range the HLG series will operate with general 115VAC or 230VAC main input, but can also be operated with 277VAC input, for industrial 277/480-volt systems in North America. The "A-Type" of "H-Series" supplies, with adjustable voltage and current, can be used to provide power in many thermoelectric applications such as cooling/warming outdoor enclosures. To operate reliably in harsh outdoor environments, each unit is fully potted in an aluminum case and are IP 65/67 rated. Typically input/output is by cable but for indoor installations some models are available with input/output by terminal block (terminal block supplies are not waterproof). Generally speaking, all the HLG series supplies will work reliably in a wide variety of indoor and outdoor, dusty, moist, and vibrating environments. With state-of-the-art LLC topology and synchronous rectifier technology the HLG series are remarkably efficient (up to 95%) and are adequately cooled by natural (free air) convection. With a wide operating temperature range from -40 ºC~-25 ºC to +70 ºC they are appropriate for almost all outdoor installations. Each is protected from short circuit, over voltage, overload, and over temperature. Higher power models in the HLG family have more functions than the less powerful, but most allow for output voltage adjustments with various dimming capabilities, typically via the output cable. The HLG series also has 4KV/6KV surge immunity (complies with EN61000-4-5) and vibration immunity up to 5Gs. See release notes to the left, or data sheets above for specifics. 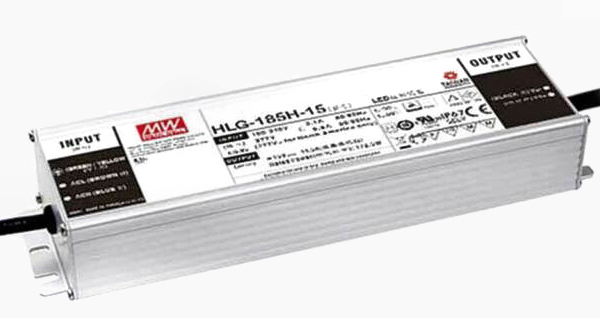 The HLG-185H-C (200W) series are for LED lighting applications with high output voltage demands. This series can be used as the power supply for thermoelectric components. With active PFC, a wide input range of 90~305VAC and 350~1400mA rated constant current output for general lighting fixtures, this series has high voltage output up to 400VDC. 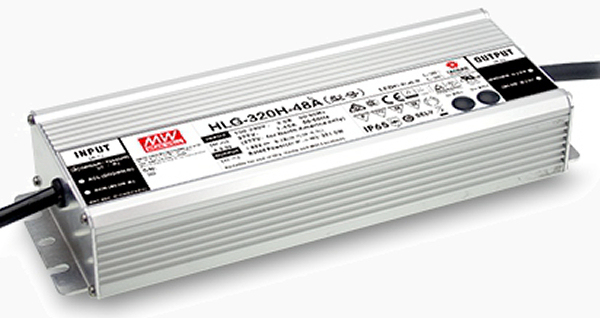 The 320 watt HLG-320H is designed for operation in “constant current (C.C. mode) plus constant voltage (C.V. mode).” This series can be used as the power supply for thermoelectric components. 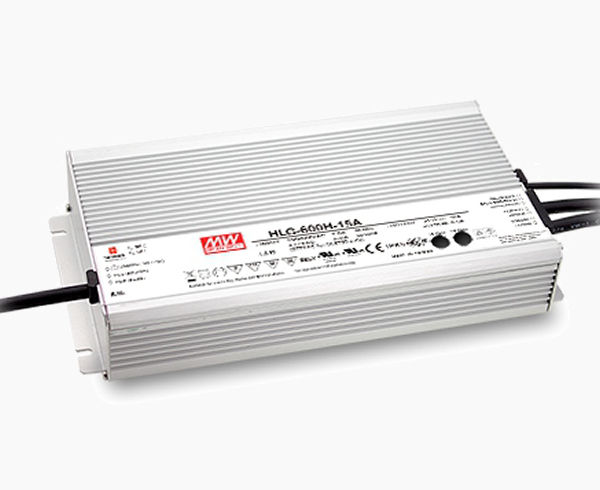 It can also be used to direct drive the LED in order to increase the total system efficiency or, with the use of DC-DC LED driver, balance current distribution. 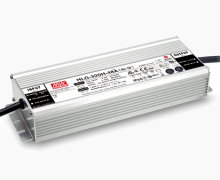 The newest member to the LED-HLG family, HLG-600H are 600 Watt, exceptionally efficient supplies primarily for heavy duty lighting applications but can can be used as the power supply for thermoelectric components. The HLG Series have global certificates for, and comply with, UL/CUL/TUV/CB/CE including UL8750, EN61347-1, and EN61347-2-13 lighting related regulations (see data sheets for specifics). Meeting these requirements assures your equipment will meet global safety and EMC regulations. 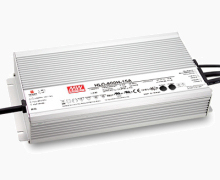 These high efficiency power supplies are very suitable for LED street lighting, LED high-bay lighting, outdoor electronic displays, LED decorative lighting, indoor/outdoor LED lighting, LED tunnel lighting, and many other outdoor electronic installations with moisture and/or dust, such as outdoor mechanical or electrical equipment and telecommunication base stations. The "A-Type" can be used as the power supply for thermoelectric components. Aluminum case fully potted with heat-dissipating glue complies with IP 65/67.